A new year begins for the Raspberry Pi community. If 2015 is anything like last year, it will find the Pi in thousands of new projects – controlling sensors, animating toys, enabling new media art expositions, bringing wonder to museum displays, and helping adults and children learn about computers. We at Raspberry Pi Geek magazine are looking forward to seeing what new madness crosses our path this year, from readers around the world who want to tell their fellow users about cool things they did with their Raspberry Pis. 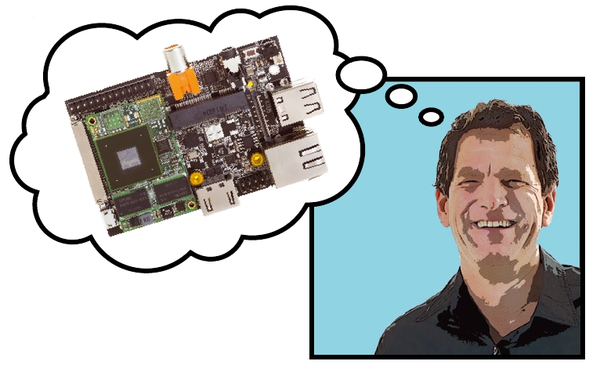 One question for 2015 is, how much will the new market of Rasp Pi clones affect the Open Hardware community? Will ARM alternatives like the Banana Pi, or Intel equivalents like the Galileo, become equally important to the community, or will Raspberry Pi continue to set the standard for the system-on-a-board hacking set. So far, the Rasp Pi has proved resilient, even though, on paper, many alternatives offer more computing power and faster interfaces. The Pi's simplicity is part of the reason for its success. An active user community and a wide assortment of available add-ons also contribute to the high profile of the Raspberry Pi. Will these assets be enough to keep the Pi in front of the pack? I have a hunch they will, at least for the next few years, but we'll keep watching. In the meantime, we won't shy from covering the best of the alternatives, along with our usual mix of inspired Raspberry Pi projects and tips. This issue includes an article on the SolidRun HummingBoard, a fast and powerful ARM alternative. We also show how to hack a classic Robosapien robot toy with an Arduino system. And, of course, we've got lots of great Raspberry Pi products and projects, including a close look at the NoIR infrared camera module, a review of the popular Kano Kit learning platform, a tutorial on the I2C data bus, and a study in how to use the Pi to receive a music stream from an AirPlay-compatible system like an iPhone or Mac. Happy New Year to all who come with Pi in hand! Read on for another journey into the wild and wonderful world of open hardware.